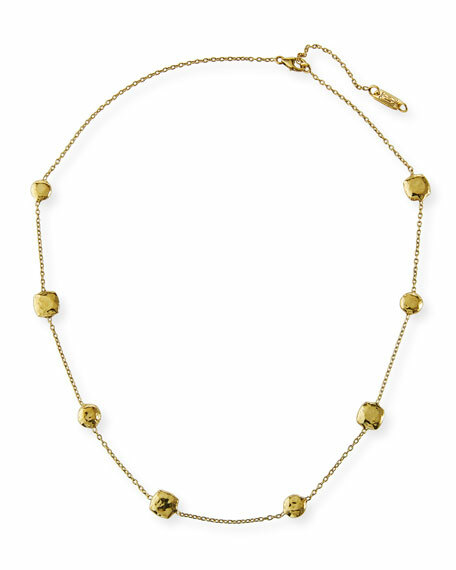 Ippolita punctuates a dainty chain with bright gold stations for a bohemian take on ladylike style. The faceted gold will catch the lights of the city when you wear it for girls' night out. Faceted gold round and square by-the-yard stations. Lobster clasp with small logo plate. Crystal encrusted tulip and stone necklace by Alexis Bittar. Polished 10-karat gold plated brass chain and hardware. Synthetic coral, lemon chrysoprase and quartz stations. Swarovski?? crystal pav?? open tulip stations. Approx. 38"L. Lobster clasp. Imported. Ippolita necklace from the 925 Rock Candy?? Collection. Sterling silver with signature hand-hammered finish. Faceted bezel stations with Clear Quartz and Mother-of-Pearl and Lapis, Clear Quartz and Hematite Doublet, London Blue Topaz. Lobster clasp. Approx. 42"L; may be worn doubled. Imported.